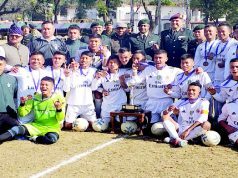 DEHRADUN, 14 Jan: Dehradun Football Academy (DFA) organised the U15, 19 Boys “Doon Cup 2019” at Mount Fort Academy with the special support of UFRA. The organiser wes DFA Founder- President and Head Coach Virendra Singh Rawat. The Match Commissioner was Dilbar Singh Bisht and the referees were Ashish Bhandari, Aman Jakhmola, Mitranand Nautiyal and Amit Kant. 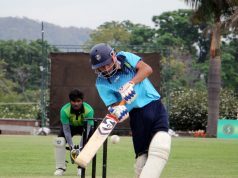 As many as 16 teams participated in both the U15 and U19 categories. The Chief Guest on the final day was social worker Surendra Sharma. The final match in the Under-15 category took place between Athurwala Football Academy and Sanskar International School. Athurwala won 1-0 with a goal scored by Atul Arya. Arya was also declared the Best Player of the Tournament. In the final match of the U-19 category, Logs FC beat DFA in a tie-breaker, 5-4. The Best Player of the Tournament was DFA player Abhay Rawat. The winning teams received Rs 5100 in cash, a trophy, medals and certificates. The runners-up received Rs 2100 in cash, a trophy, medals and certificates.